Raspberry Rainbow: Newsflash! It CAN happen! There is a bottom! Newsflash! It CAN happen! There is a bottom! Did you know there was a bottom to the washing basket? There is a bottom. I found it last night. I am not sure if I have ever seen it before. I wonder if I will ever see it again? But there is a bottom. A wonderful empty bottom. It may have only lasted for a few hours, but I'll take what ever I can get after this week, it has been awful. I'll talk about my awful week another time. Maybe. 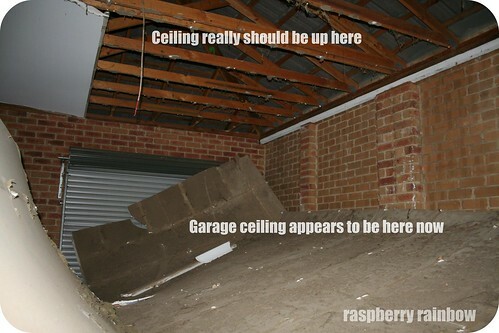 The ceiling in our garage is not fine though. I hope you all have a lovely weekend. I hope your ceilings stay where they should. If I was a garage dweller I'd say the sky was falling in...though really it's no laughing matter is it. I love the red laundry container..beautiful..as is seeing the bottom of it! Looks like the glue came unstuck, Pity they didn't use nails--- and not a hurricane in sight--- A real OMG situation. Just not what you need right now! PS. i haven't seen the bottom of the laundry bag for a very long time. i didn't realise that a laundry basket had a bottom! phew..luckily no one or nothing got under that roof. Dear oh dear, I hope your garage is able to be fixed asap. Also hope no one was injured?! I sure hope no one was hurt! Yay for empty laundry baskets. I rarely see the bottom of mine either. I feel your pain on that one. Oh no! Think you should invest in a more rigid washing basket, you may need it for shelter! Come over to my place and you will find I have awarded you a "Versatile Blogger" Award..for being clever! There is a bottom? You are welcome to come over and find my basket's bottom any time. I haven't seen it and I don't think I will any time soon in this weather. Oh my goodness Cat!!! Certainly not what you needed right now!!! 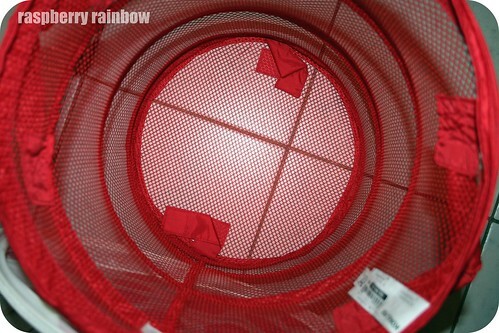 So glad you can find joy in things like the bottom of the washing basket - It's the best feeling!